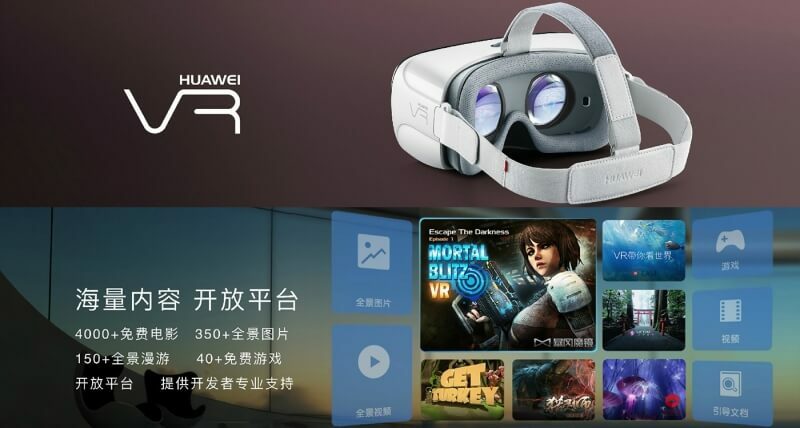 Huawei has become the latest company to embrace virtual reality. At its P9 smartphone launch event in China today, the company unveiled the Huawei VR, a phone-based headset that looks very similar to the GearVR. Like Samsung’s device, the Huawei VR uses a smartphone sitting inside the headset to provide power and the screen. It is, however, the first major virtual reality headset to use USB-C and not micro USB. Other similarities to the Gear VR include a touch controller, volume rockers, and a back button on the side, as well as a focus wheel on top. One issue the Huawei VR could face is the fact that the three smartphones the headset works with – the P9, P9 Plus, and Mate 8 – use 1080p screens, whereas Samsung’s GearVR-compatible phones are 1440p. This lower resolution may not produce the best virtual reality experience. Some other details include 20ms latency, -7.00 myopia, a 95-degree field of view, and an anti-blue light filter. The company also added that this will be the first headset of its kind to offer 360-degree sound, providing you are using supported content and have your own headphones connected. Huawei promises that at launch its headset will offer over 4000 movies for free, but it’s assumed that only a tiny percentage of these will be full-VR videos. There will also be 40 free games, 150 panoramic tours, and more than 350 panoramic images to search through.